This is a great solution for the problem of jogging or bike riding at night. 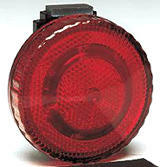 By using 6 alternating LED lights, this flasher can be seen for over 250 yards! Besides a belt clip, there is also a built-in magnet that makes this flasher very handy in case you have car trouble...just stick it to the car. It will warn passing traffic of your predicament. In case of a 911 home emergency, place this in a window for quick identification of your home by the responding emergency team. Extra bright, high intensity LED lights. Seven functions with different flashing patterns. Includes heavy duty PVC bike mount, arm or wrist strap and belt clip. Can be worn like a pager. A must for every biker, jogger, child or stranded motorist. Requires 2 AAA batteries.